Iliotibial Band Stretch for Pain Relief! It can be tough to do an Iliotibial Band Stretch when the pain and tightness you are constantly feeling is often what’s causing your pain. Achieving a good IT Band stretch every day is one of the keys to easing the discomfort caused by IT Band Syndrome. ITBS is generally generally seen in runners or endurance athletes who increase mileage quickly and with bad form. It is caused by excessive friction between your Iliotibial Band and your knee (or hip) bone. This causes a sharp pain usually running down from the outside of your hip to the outside of the knee. · Lay on your back with legs long and arms out to the sides in a “T” position. · Wrap a band or towel around one leg and then extend that involved leg up toward the ceiling giving it a little bit of tension with your arms. · Pull that leg ACROSS your body toward the floor on your opposite side. Keep your upper body firmly on the mat, shoulders heavy as you rotate from the waist. · Feel the IT band stretch more as the leg comes closer to the floor. · Hold for 10 - 30 seconds easing in to the stretch a little more as you repeat for 3-5 times. You can modify this hip stretch by bending the affected leg at the knee as you bring it across the body. Stretch #2 · Sit on the floor or a mat with your legs out in front of you. · Bend the knee of the involved leg and cross that leg over your straightened opposite leg, placing your foot flat on the floor. · Rotate your body to look over the shoulder on the involved side. You should feel a the iliotibial band stretch running along the side of your hip and leg and also in the piriformis muscles deep in your buttocks. · Hold for 10-15 seconds. · Cross the involved leg BEHIND the opposite leg. · Lean to the uninvolved side until you feel the Illiotibial Band stretch on the affected leg. · Hold for 30 seconds. Check out this page for one of my favorite ways to do an Iliotibial band stretch and to balance the hips and loosen the IT Band. Check it out on my video here! A large foam roller is a great tool for getting a good Iliotibial Band Stretch. Using a foam roller helps break up adhesions between soft tissue underlying the IT Band and the IT Band itself, which can relieve your pain. Find out more about IT Band Treatments here. First sit on top of the foam roller and roll the meaty or muscular part of your bottom then progress to side lying on the foam roller, with the affected leg on the roller. Bend the knee of your top leg and cross it over your affected leg, so that your foot is flat on the floor. Roll up and down the IT Band gently, from the hip joint to just above the knee. You can guide yourself with your hands (on the floor) and your top bent leg adjusting the amount of weight and pressure you can handle by putting more in your hand or bent leg. When you find a tight (usually painful) area, stop rolling and “hang out” there for 20-30 seconds, or until pain decreases by about 75%. The sensation of rolling will range from a gentle pressure to somebody taking a jackhammer to your IT Band. Work gradually into the pain, not all at once. Over time the pain will lessen. The more often you roll, the less painful the iliotibial band stretch becomes. You will see a noticeable difference in the way you feel afterward--often I feel lighter AND looser! Try it….it really works. 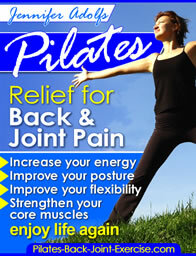 Find out more how Pilates exercises can help with your hip and leg muscles pain and weakness here.